Navigate to the 'Layouts' section of your account and proceed to the layout builder of the relevant layout. Create/ select the zone you want to add the plugin to. Click 'Plugin' and select 'Dynamic Data' to add the plugin to the zones playlist. If you haven't created a zone, click here to find out more. List rows - Will list all the rows of data from the sheet selected, you can then use queries to search for specific rows. Show device item information - Will show the data from the column selected, of the row that a device has been configured to show from the sheet selected. Show touched item information - Will show the data from the column selected of an item that was touched. Must create a touch event on the zone/ playlist item containing Dynamic Data with a list of rows. Queries are a way to show specific rows of data from the sheet selected. Press 'Add a query' to add multiple queries. To remove a query, click 'Remove' to the right of the query you wish to remove. Connector - If 'And' is selected items have to match this query and the previous one. If 'Or' is selected, items have to match either this query or the previous one. Column - The column you want to search to show specific rows. Search types - The rule you want the input specified to use. Search value - The value or column to search for. 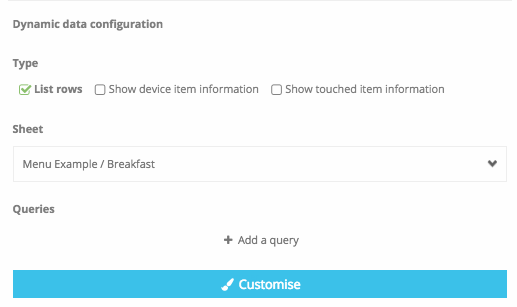 For our example we want to show all of the data that is on the 'Breakfast' sheet from our 'Menu Example' source, so our settings would look like the image below.